The power conversion efficiency of mesoporous perovskite solar cells (PSCs) is closely related with TiO2 mesoporous layer. As the most universal mesoporous layer material, however, TiO2 does weakly in electrical properties. As a result, structure modifications of TiO2 mesoporous layer are required. In this work, niobium/tantalum doped TiO2 mesoporous layer were prepared via a facile one-pot solution process, and applied successfully as high quality mesoporous layer for mesoporous PSCs. 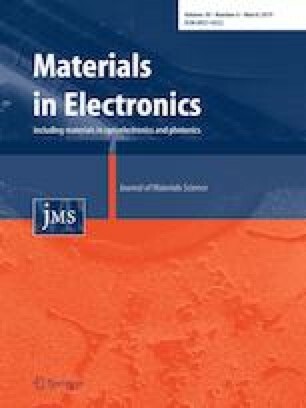 Performance of perovskite solar cells prepared with Nb/Ta-doped TiO2 mesoporous layer enhanced apparently compared with the control device, especially in the short circuit current density (Jsc) which was improved from 18.4 to 21.3 mA cm−2. We appreciate the financial supports from Natural Science Foundation of Jiangsu Province (BK20160262), the Fundamental Research Funds for the Central Universities (2018QNA06), and Promoting Scientific and Technological Innovation Foundation of Xuzhou (KC18067).